The beaches below not only help you avoid hot summer days but also give you the chance to sightsee stunning sceneries. Far away from the center of Nha Trang City, Dai Lanh Beach is quite among the fresh green color of pine trees with fine white sand beach and white waves. Sea water is so pure that we can see small colorful fish swimming under the white sand bed. The beach is quite shallow and sloping lightly to far distance to ensure the safety for tourists. This is one of famous landscapes and sea tourism destinations in Van Ninh district, Khanh Hoa province. At weekends, escape from noisy city, we go to Ba Li Stream (Cam Lam District, Khanh Hoa) to be with the quiet wild nature. 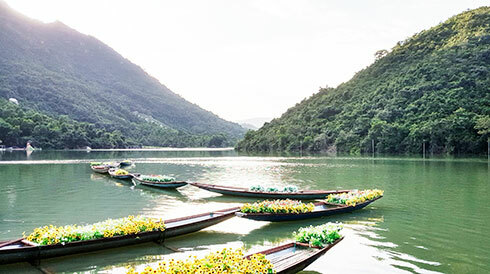 Location: Mui Doi - Hon Dau locates in Hon Gom peninsula of Van Phong Bay, Van Thanh Commune, Van Ninh district, Khanh Hoa province. Ponagar Temple Festival 2013 took place in Nha Trang from April 30 to May 2. The festival means to commemorate Thien Y A Na Goddess. It comprises solemn rites and arts activities. This is the biggest annual folk festival in Khanh Hoa Province, attracting thousands of pilgrims and tourists annually. The 2013 Goddess Ponagar Festival opened in Nha Trang city, central Khanh Hoa province on April 30 (or the 21st day of the third lunar month), attracting ten of thousands of pilgrims from surrounding provinces.